Investors in Puerto Rican government debt are a mixed bag, including some mom-and-pop mutual funds like OppenheimerFunds and Franklin Advisers, which have been prioritized in the restructuring costs because of the length of their investments and the fact that they paid more for them. But over the past few years there’s been a growing presence of hedge funds, which avoid regulatory oversight and are solely interested in profit, regardless of how a national—or, in the case of Puerto Rico, territorial—economy performs. Vulture funds, their more extreme counterparts, specifically target debt that is distressed or in danger of default in troubled economies, hoping to cash in on settlements after buying the debt for pennies on the dollar. They can paralyze attempts at debt restructuring by insisting on repayment at full face value. Given Puerto Rico’s recent history of privatizing its airport and highway toll collection system, it is vulnerable to further selloffs—even its prized university system—as concessions to the vultures. Because of all the press rumblings about an upcoming showdown between the high-rolling owners of the island’s municipal bonds and a government that continues to scramble to be allowed Chapter 9 privileges, the gathering at the Citigroup headquarters in Midtown had an air of tension surrounding it, but it turned out to be a rather pedestrian reset of what we already know. Melba Acosta Febo, president of Puerto Rico’s Government Development Bank, restated Puerto Rico Governor Alejandro García Padilla’s themes of shared sacrifice between bondholders, government, and ordinary citizens alike, and then Krueger launched into a frenetic PowerPoint presentation highlighting her supply-side suggestions for economic restructuring. “Puerto Rico’s minimum wage, at $7.25 an hour, is 88 percent of its median wage,” she said clinically (in fact, her own report as well as the Bureau of Labor Statistics put the figure at 77 percent). 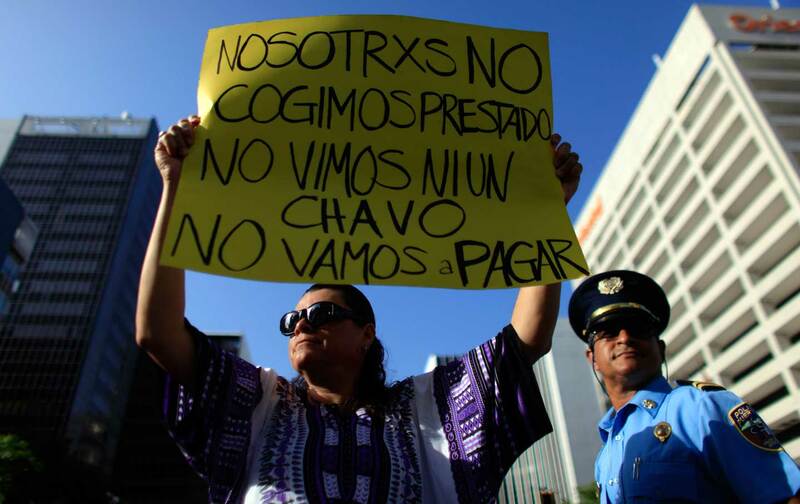 “Most economists conclude that half that amount would be beneficial.” One major problem for the island, according to Krueger, is that it is competing with neighboring Caribbean islands, whose wage scales are lower than Puerto Rico’s, which is set by US minimum-wage law. She also suggested that welfare payments are “very generous relative to per capita income,” causing a disincentive to work for minimum wage. This ignores the fact that, as the pro-statehood party correctly argues, such payments are capped at levels significantly lower than what residents would receive if Puerto Rico were a state; the island’s lack of full entitlement is one of the reasons Puerto Ricans are second-class citizens. These assessments lay bare the fading promise that lies within Puerto Rico’s status as an unincorporated star in the US safety-net orbit. In a way, the federal entitlements provided to Puerto Ricans were part of the bargain to offset their watered-down citizenship, at least during the postwar boom years. But now that neoliberal free-trade models reign amid a Great Recession still weighing significantly on the mainland, the United States can no longer afford to prop up the island’s living standards and must defer to its deregulated banking system’s needs, which are to place the island in its “proper” Caribbean context. In the end, Krueger ever so slightly walked back the harshness of her remedies by saying that rather than slashing the minimum wage, a provision could be made that it should not be allowed to rise as it might on the mainland, until it “has reached the per capita income” of the poorest state in the Union. This is where Krueger comes off much less as an economist than a politician, or a family therapist who is leading an intervention on a problem child. There was an absence of fireworks in the question-and-answer period, which featured Deutsche Asset & Wealth Management’s softball inquiry about what impact a lengthy litigation process between the island and its bondholders would have on the economy. Where were the vultures of Wall Street who so stridently demanded a pound of Argentina’s flesh just last year in a courtroom a couple of miles downtown? Most of the original Puerto Rico bond-buyers were traditional municipal fund houses like OppenheimerFunds, a party in a successful challenge to García Padilla’s attempt to legislate Puerto Rico’s right to a debt restructuring that resembles bankruptcy. But the landscape has shifted in the past five years, when hedge funds and their more speculative cousins, vulture funds, came to hold increasing amounts of the island’s debt. Some sources say that hedge and vulture funds combined own close to 50 percent of the island’s debt. This tendency took off big time in March 2014 with a municipal bond issue of an unprecedented $3.5 billion by the island’s Government Development Bank, with the deal brokered by Barclays. Last week two investigative efforts, one by an activist group called the Hedge Clippers and another by Puerto Rico’s Center for Investigative Journalism, tried to methodically identify the hedge- and vulture-fund owners of the debt. Among them are BlueMountain Capital (which according to Hedge Clippers has hired an army of Washington lobbyists to oppose the Chapter 9 efforts in Congress) and Stone Lion Capital, which includes Paul Tudor Jones, who founded the Robin Hood Foundation, a nonprofit founded by Wall Street high-rollers that claims to apply “evidence-based” solutions to fight poverty. Many of these hedge-fund operators have also been targeted by activists because of their ties to New York Governor Andrew Cuomo and their influence on pro-landlord and charter-school legislation. A July protest at a swanky Hamptons fundraiser that was originally called under those themes was re-envisioned to include the Puerto Rico issue. Another salient figure is John Paulson, who has not only bought $120 million in bonds but also invested in the island’s largest bank and several major hotel properties. Along with Alberto Bacó Bagué, García Padilla’s Secretary of Economic Development and Commerce, Paulson has pitched Puerto Rico as a tax shelter for renegade billionaires, saying it can become the “Singapore of the Caribbean.” Paulson also helped host former New York City Mayor Rudolf Giuliani as keynote speaker this past February at the Puerto Rico Investment Summit at the San Juan Convention Center. Under the previous administration of Governor Luis Fortuño—a fiscal conservative who cut government jobs and attacked unions—the Puerto Rico legislature passed two laws, the Export Services Act and the Individual Investors Act. The first law gave hedge-fund managers a flat 4 percent tax rate as an incentive to move operations to Puerto Rico, while the second offered investors complete tax exemptions on dividends, interest, and capital gains, provided the investor lived on the island for half the year. García Padilla’s more moderate administration has embraced this policy in a desperate attempt to maintain outside investor interest. The Puerto Rico Center for Investigative Journalism’s list features a handy chart that illustrates how many of these hedge- and vulture-funds have also had a hunger for investments in troubled places like Greece, Argentina, and Detroit, which famously declared bankruptcy last year. Three funds, Aurelius Capital, Monarch Alternative Capital, and Canyon Capital, have been involved in all four, while Fir Tree Partners and Marathon Asset Management, among others, hold a trifecta of Puerto Rico, Greece, and Argentina. Paulson has also invested heavily in Greek banks. The disingenuous smoke-and-mirrors tactics of many of these hedge and vulture funds should make their legal claims ethically and morally dubious, but such considerations count for little in this high-stakes face-off. For instance, Double Line Capital’s Jeffrey Gundlach more than doubled his holdings of junk-rated bonds as recently as last May. In an interview with Bloomberg News, he said he compared the investment potential in Puerto Rico’s debt to US mortgage markets in 2008, evoking the perfect-storm conditions that helped set off the Great Recession. Many of these funds are now organized into the Ad Hoc Group, which represents 35 investors and $4.5 billion in bonds, and the PREPA Group, which is currently negotiating with PREPA, the government electrical utility company, which narrowly avoided default on July 1. One reason the vultures and hedges may not have begun their attack in earnest yet is that they are awaiting completion of the PREPA negotiations. The Puerto Rican government itself is likely to use some of the same bond-swap or maturation-delaying proposals in those negotiations as the ones in the restructuring proposal currently being prepared by García Padilla’s economic recovery working group. The lists compiled by Hedge Clippers and the Center for Investigative Journalism are based on reports in the business press and were confirmed by accessing public records and in some cases verifying with the hedge funds themselves, but they are not definitive. So on Monday, the Center filed a lawsuit in a San Juan court against Governor García Padilla and Melba Acosta to force them to disclose the list of hedge funds that hold the bonds, the members of the ad hoc group that has been meeting with her and other public officials, and the written conditions for renegotiating payment terms as well as future bond sales. (They also asked for the complete Krueger Report; the document released in June and presumably distributed at the Citigroup bondholder meeting on Monday has the look, according to the Center, of an executive summary, but on Friday, the GDB officially certified that the version released in June was the complete report.) “If they certify they’re saying they paid $400,000 for this 26-page document, that doesn’t explain how they got to their conclusions or recommendations or what the net effect on public finances they would have,” said Carla Minet, director of the Center. Tuesday the Center published a bombshell article that disclosed that hedge- and vulture-fund representatives “visit the offices of legislators at the Capitol constantly.” According to the report, they are sometimes accompanied by lobbyists like pro-statehood party members Kenneth McClintock and Roberto Prats, who also happens to be a major Democratic fundraising bundler and chair of the Democratic Party in Puerto Rico. Yet the article’s sources for these revelations, commonwealth party Senator Ramón Luis Nieves and Melba Acosta, for the most part claim to not remember or know the names of the hedge funds or their representatives. “[Acosta] was not even concerned about vulture funds and hedge funds,” said Minet, one of the co-authors of the article. “She was more worried about Oppenheimer and the mutual funds.” The judge hearing the lawsuit found that some of the Center’s requests for information were valid and instructed them to re-petition the GDB with a specific request for a list of bondholders and the amounts owed. Meanwhile, last Wednesday three members of the Government Development Bank, all from the private sector, announced their resignation. This followed the resignation of GDB chairman David Chafey. Earlier in the day, Puerto Rico’s Office of Management and Budget introduced a legislative proposal that would allow government and municipal workers to voluntarily cut hours in their work day, a measure that could save up to $133 million. Eerily symbolic was the Agriculture Department’s announcement the same day declaring fourteen municipalities disaster zones because of the island’s months-long drought.